Buy one get one deal at Bruster's. Buy one waffle cone get one free or buy one 8" or larger cake & get a free one quart of ice cream. Click the link below to go to the coupon page. 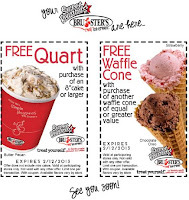 Print your coupons & take them to your nearest Bruster's location. Exp 2/12/13.